Update Oct 28 2007:: The webcam now works! Update Oct 18 2007:: Suspend/Resume works with the 2.6.23 linux kernel. I purchased a Sony VGN-SZ650N/C in September 2007. Full specs are here. It’s a great laptop except for the fact that you have to pay the Microsoft Tax and that the preinstalled vista has a whole heap of junk preinstalled (I’ve never seen anything quite this bad before. Anyways, this is not a review, there’s plenty of those online already, but an attempt to document my efforts to make the GNU/Linux distribution: Ubuntu Gutsy Gibbon (32 bit)Â run smoothly on this laptop and by extension, hopefully the rest in the VAIO SZ6xx series. Most of the stuff in here is more or less distribution independent and should work on recent version of Fedora/OpenSUSE/Gentoo/whatever as well. I have not had the time to spend too much time on all of the items below yet, this is very much a document “under construction”. If you happen to have something working which I have not mentioned/solved yet please write me and I will put it here (and give proper credit of course). Here is the output from lspci in stamina mode. The installation worked without any problems (using Ubuntu Gubsy Gibbon Tribe 5), I used the “stamina” mode. Worked partly out of the box. The sound works, but speakers are not independent from the head phone plug. This means that plugging in head phones does not mute the speakers, and the speakers cannot manually be muted without also muting the head phones. 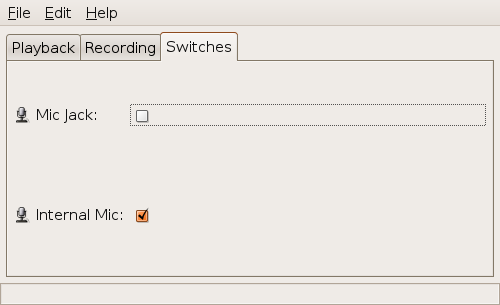 In general, alsa exports very few controls for the sound card (which is a Intel Corporation 82801H (ICH8 Family) ). Ubuntu is running Alsa version 1.0.14, and the changelog for 1.0.15rc1 lists a lot of changes to the snd-hda-intel driver, which is good. I have not tried installing any release canditate of 1.0.15, but will probably try it. Suspend/Resume works with the 2.6.23 release of the linux kernel. See The Master Kernel Thread for help on compiling your own kernel. Note that you will have to install the wireless drivers for the Intel 4965 wlan card as well, which is a bit tricky. More information about that process can be found here. works by patching the Ricoh R5U870 linux driver as explained by Utz-Uwe Haus. Not tested yet, should work out of the box. You need to use different xorg.conf files. This little script by Ariel Vardi copies the right xorg.conf file on startup depending on whether or not the nvidia card is activated or not. The script should be placed in the /etc/init.d so it is run on startup (before gdm) and the two xorg configurations (speed and stamina) should exist, full details on Ariel Vardi’s excellent site. ok, now it works. I have not tried negative values before :-). Using negative values reduces the brightness. Has anybody succeeded in setting up both the intel X3100 and the Nvidia 8400M to be used with compiz? I got an SZ650N recently and this page is great! I haven’t been able to get the touchpad working as it should, i.e. with tap-drag to drag windows, or with scrolling. Also, the lid switch doesn’t work for me. Anyone have these two problems solved? Hey, I have an SZ640 which has recently lost all signs of life. It was working fine the night before, but wouldn’t start the following morning. Has anyone else had this problem? Any suggestions as to what the problem might be would be great. That can happen if you let your battery deep discharge – I did that by accident a few times with my old Acer Aspire by leaving it suspended for ages. I just had to let it charge for a while before trying to switch it back on. Has anyone upgraded to Hardy? If so, is you sound working properly? My headphone jack is not working, once again. Hi! great site! I would ask how to tur on and off the bluetooth becouse it is turnet on by default! To your modules configuration file. After adding that line I have no sound. Any ideas? Did you put it in the modprobe.conf file? Did you check that the sound is not simply muted, try opening the Gnome mixer. I check the sound, it isn’t muted. I put it in the alsa-base file, is that not right? Thomas, are you using 8.04 without any sound problems? I haven’t found any other suggestions so my headphone jack still isn’t working. No, I haven’t. I’ll check it out thanks. Without this line, options snd-hda-intel model=vaio in alsa-base, I get sound but only from the speakers. When I add that line, I get no sound. It’s not that the sound is muted. I checked both the gnome alsa mixer and alsamixer in the shell. My sound worked with alsa 1.0.15, so I thought I’d go back to that. I’m having troubles compiling it, however. scripts/Makefile.build:46: *** CFLAGS was changed in “/usr/src/alsa-driver-1.0.15rc2/acore/Makefile”. Fix it to use EXTRA_CFLAGS. Stop. Thanks, I hadn’t seen it, but I’ll check it out. As for my sound, without this line, options snd-hda-intel model=vaio in alsa-base, I have sound from the speakers. When I add it, I have no sound at all. – Suspend and Hibernate not reliable. – Integrated Memory Stick reader can not be mounted. Any suggestions specially for the first problem? Just an update that it appears a fingerprint scanner solution is in the works and UPEK had confirmed several times that a driver is in alpha and hopefully beta by now. I have emailed them requesting the driver if it is to beta condition (they targeted a 5/2008 release). That’s interesting, thanks for the update! Well I got a reply. It’s not a driver they are releasing, but rather a SDK. According to the EULA the library itself is redistributable so it looks like we have what we need now to write a interface, possibly integrating with fprint. Mirek Buran, the same guy others have talked with is how gave me the link and again asked that I not redistribute the package of course. I’ll work on a proof of concept / test that it works and update here soon! I’ve got a Vaio VGN SZ61 and first of all I have to say thx cause youre page helped alot since I´m new to Linux. If brought the Motion Eye Camera to work with the R5U870 driver, but it but it works not correctly with wengophone and linphone(Wengo->Alot of Green Pixels in the Picture, Linphone->Totally distored Picture, mostly black). I was wonder if you maybe know what this problem may cause or if other SZ6 useres have the same problem. I guess I never really used the speed/stamina switch or something, and only recently learned that it switched graphics chips. Now I want it to work, but I guess it is broken. With the switch in either position lspci never lists nVidia. Is there a way other than the switch to get speed mode?